Home // Welcome to Spring Break 2019! Start your planning now! Break out your bathing suit and sunscreen when you stay at the Country Inn & Suites® by Radisson, Vero Beach-I-95, FL. Our hotel is conveniently located off I-95 and Highway 60. Take advantage of easy access to the tranquil shores of South Beach, known for its wide swathes of soft sand and its crystalline water. Start every morning with our free, hot breakfast, and stay energized between activities with free cookies, coffee and tea in the lobby. Then head out for the sand and sun and a whole lot of fun. 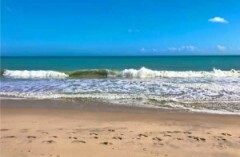 After swimming or sunbathing, treat yourself to a shopping spree at the nearby Vero Beach Outlets or a round of golf at Pointe West Country Club. Offer is available for stays from April 21, 2019, to May 30, 2019.